Author/Creator written in the format: Lastname, FirstInitial. SecondInitial. eg. John Andrew Smith would be Smith, J. A. 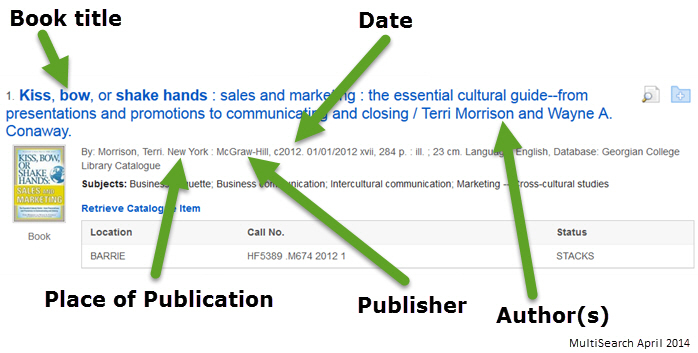 See "where do I find" section for how to find the author, date, title, city and publisher information. Keohane, R.O. & Nye, J.S. (2012). Power and interdependence (4th ed.). Boston, MA: Longman. Rourke, J.T. (Ed.). (2014). Taking sides. Clashing views in world politics (16th ed.). New York, NY: McGraw-Hill. Morrison, T. (2012). Kiss, bow, or shake hands: Sales and marketing: The essential cultural guide--from presentations and promotions to communicating and closing. New York, NY: McGraw-Hill. Little, C. M. (2014). Fetal development: Environmental influences and critical periods. In C. Kenner & J. W. Lott (Eds. ), Comprehensive neonatal nursing care (5th ed., pp. 1-27). New York, NY: Springer Publishing Company. 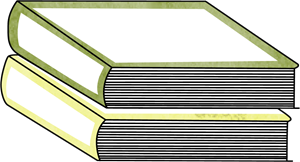 TIP: Books with essays or chapters written by different authors often have an editor as well. You need to include this in your reference page entry. Gallant, M. (2005). My heart is broken. In R. Brown & D. Bennett (Eds. ), Canadian short stories (pp. 130-136). Toronto, ON: Pearson Education Canada Inc. Note: If the resource does not have a DOI, APA guidelines ask you to find the base URL of the database to provide as the "Retrieved from" URL. Try searching Google for the database name - in this case "EBSCO eBook collection". When a source has only one author, prepare your reference list entry by typing the author's name in the format Lastname, Initials. If your source has two authors, format the authors' names (Lastname, Initials) and include with an & in between. Schöpfel, J. & Leduc, C.
Bush, A.A., Nipperess, D.A., Duursma, D.E., Theischinger, G., Turak, E. & Hughes, L.
If you have 3-5 authors: the first time you use an in-text citation, include all authors' last names. If your source has more than 8 authors, include the first six authors' names in the correct format (Lastname, Initials), then add a ... and include the last author's name. Ngongo, P.B., Priddy, F., Park, H., Becker, J. Bender, B., Fast, P., ... Mebrahtu, T.
TIP: You may need to click on the article title (as above) to see all authors' names and retrieve the last author for your reference page entry. Subapriya, K. K. (2009). The importance of non-verbal cues. ICFAI Journal of Soft Skills, 3(2), 37-42. Publication Date is usually found anywhere from the middle of the page to the bottom of the verso. If publication date is unavailable, then use Copyright year. These two concepts are not the same even though the years usually match. Publisher name may be found near the top of the verso or at the bottom of the main title page. Place of publication can usually be found at the bottom of the main title page (or the top of the verso/other side). DOI is the short form for "Digital Object Identifier", a unique number (eg: 10.1037.a0034500) given to SOME resources, designed to help find a particular items quickly. DOIs are sometimes used in citations. If a DOI is available, you do not need to use "Retrieved from..." in your citation, just use the DOI. If the resource does not have a DOI, APA guidelines ask you to find the base URL of the database to provide as the "Retrieved from" URL. Try searching Google for the database name - in this case "EBSCO eBook collection". You may also want to ask your professor if they'd prefer to know what Library database you used. You could substitute "EBSCO eBook collection" for the URL if your professor prefers.